On Friday, Feb. 8, Hillel and the Muslim Student Association will host the ninth annual Avi Schaefer Shabbat at Union. 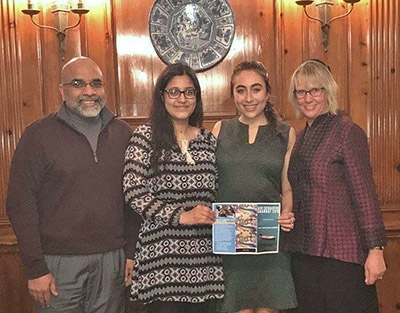 “This Muslim Jewish Dialogue Dinner is an amazing event open to students, staff and community members of all faiths and backgrounds,” says Hannah Ellen ’19, Hillel social justice chair, who has helped lead and champion the dinner since coming to Union. Hillel President Liza Wolf ’19 explains that the event honors the memory and work of Schaefer, a Class of 2013 student at Brown University and son of an American rabbi. He had served in the Israeli Defense Forces with his twin brother and was committed to creating dialogue and building bridges between Jews and Muslims. But shortly after starting his freshman year, he was killed by a drunk driver in Providence, R.I.
Union was one of the first schools to participate, with programming ranging from jumah prayers to Kabbalah Shabbat. “Since the 2016 presidential election, dialogue has mostly focused on shared issues around rising anti-Semitism and Islamophobia,” Cramer said.